DESCRIPTION STUNNING VIEWS!!! 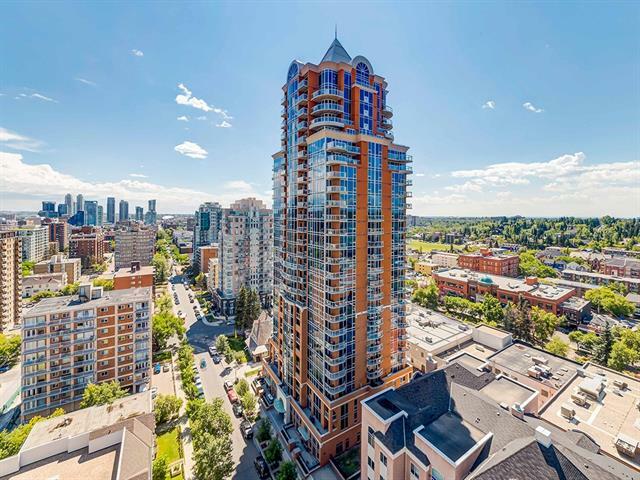 2 LARGE BALCONIES OFFERING CITY SKYLINE AND UNOBSTRUCTED PANORAMIC VIEWS FROM EAST TO WEST! Modern, industrial & contemporary - Exposed concrete ceilings + pillars. Floor to ceiling windows that expand across your living and dining room area. Open kitchen features a large island, high-gloss white cabinets, quartz counters, glass tile backsplash, full SS appliance package w/gas stove. Huge master bedroom with custom dual closets, 2nd balcony + spacious ensuite - soaker tub, separate glass shower and vanity featuring floor to ceiling window! 2nd bedroom + 3PC bathroom. Insuite laundry. Gas BBQ hook up on your massive south balcony! 2 TITLED UNDERGROUND PARKING. 1 TITLED UNDERGROUND STORAGE LOCKER. Many amenities include - heated infinity pool, large deck area, fitness room, sky lounge. Footsteps to restaurants, transit, shopping and DT Core. Fantastic condo! Home for sale at #3007 1010 6 ST Sw Calgary, Alberts T2R 1B4. Description: The home at #3007 1010 6 ST Sw Calgary, Alberta T2R 1B4 with the MLS® Number C4202054 is currently listed at $799,900.